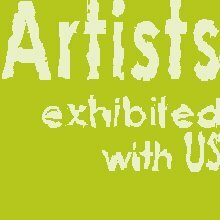 Featuring New Works by Five Malden Artists: Kelvy Bird, M. Steve McCauley, Carolina Pachon, John Rodzvilla, and Bartek Walicki. 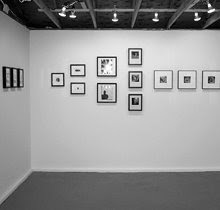 Exhibition Dates: February 11 - March 11, 2006. Potluck Reception: Saturday, February 18, 2006, from 12noon to 3pm. Artists' talk beginning at 1pm . Exhibition on view these Saturdays: 2/11, 2/18, 3/4 & 3/11. Gallery Hours: 12noon - 5pm and by appointment. 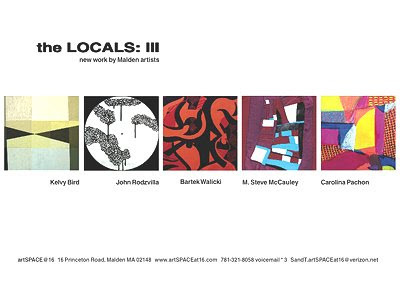 The LOCALS is an ongoing exhibition series in artSPACE@16's effort in identifying artists living or working in Malden. These exhibitions aim to encourage visual artists to develop and share new work as well as to promote dialogue and educational experience between artists and the general public. 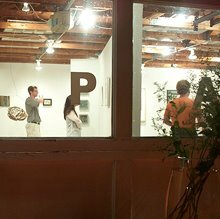 They also strive to promote awareness and appreciation of art in our burgeoning creative community. "We're right here in the community." 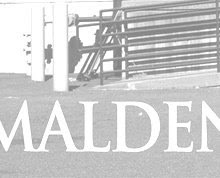 Malden resident Kelvy Bird was raised in the Hudson River Valley and holds a BFA in Painting and a BA in Art History from Cornell University. Her painting and drawing series on view at artSPACE@16 are about quieting a noisy field to locate self and softness. 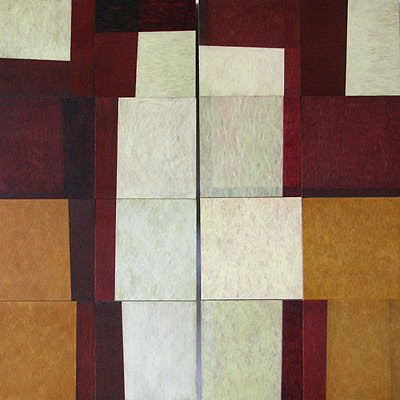 This soothingly colored series entitled "GRIDS", focus inquiry into the nature of cohesion within relationships. Some pieces present intact scenarios; others have an unfolding storyline, as audience participation defines the array of a rotating, puzzle-like sub-grid. Bird states, "It's my attempt to block out all that is non-essential, to let a clear, inner chord find its place in the hum. I want my work to address felt, often silent, emotional tensions and the lines of human connection we travel when invisible dynamics become known and seen." It is the artist's intention that her work reaches the viewer in an intuitive way so that the meaning of a piece springs to life only as it touches someone's memory and imagination. 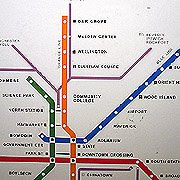 Kelvy Bird has been actively exhibiting her work in the greater Boston area including 38 Cameron in Cambridge, Willoughby & Baltic Gallery, Somerville Open Studios, Somerville Museum, Brickbottom Gallery, The Nave Gallery, Diesel Café in Somerville, and the West End Café Gallery in Malden. Her paintings, also exhibited in private and corporate collections around the country, generate inquiry into our understanding of relationship. 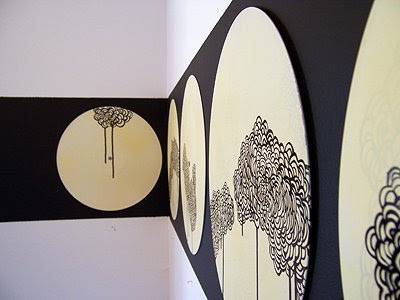 Besides working as a graphic facilitator in the field of organizational development, Bird spends time creating artwork in her studio at Vernon Street Studios in Somerville. Bird is a volunteer involved in activities that increase the presence of art in the public sphere in Massachusetts. She will be co-organizing the very first Windows Art Project for Malden with Naomi Brave in this upcoming Fall of 2006. 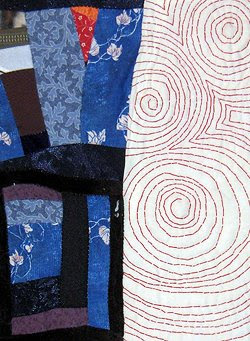 M. Steve McCauley presents her latest fabric work series entitled "Sacred Spirals". The spiral and circular shapes in her work have long been used to represent the cycle of death and rebirth, as well as the perfection of the universe. Inspired by quilt art, these pieces combine the meditative aspect of Mandala with the spiral shape seen in nature. The spiral patterns found in each piece are reminiscent of the natural world, reminding the viewer of the curve of a seashell, the double helix strands of DNA or the concentric circles of a pebble dropped in a puddle. While embroidering the shapes and patterns in her pieces, the artist often becomes consumed in the work, the repetitive task of stitching inducing a trance-like state. The work becomes a tangible representation of her meditation. McCauley, who earned a BS in Fine Art at Skidmore College, states, "The choice of materials lets the viewer relate to the work in a way one cannot relate to a painting; everyday we are covered by the clothing we wear, the sheets on our beds - fabrics are a part of everyday life. Creating art transcends daily life, bringing brilliance out of the mundane and transforming repetition into prayer." Image: fabric works by McCauley. 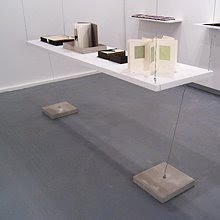 McCauley has exhibited in alternative gallery spaces in New York City, Massachusetts, New Hampshire, Ohio, Illinois, Georgia, Virginia and California; as well as Switzerland and Germany. 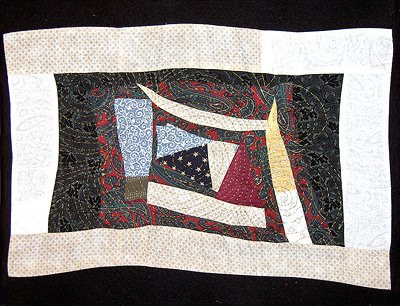 Her recent exhibitions include: LOVE SMALL juried by Adria Arch, and SMALL WORKS: II, juried by Leah Oates both at artSPACE@16, Malden, MA; HOUSE OF CARDS, an Exhibition of the Emerging Art of Artist Trading Cards which was held at Columbus Center for Paper and Book Arts, Columbus, OH. Born in Colombia, Carolina Pachon earned her Baccalaureate from Massachusetts College of Art and has attended residency programs at Haystack School of Arts and Crafts, Maine, Chautauqua School of Art, New York, and Vermont Studio Center, Vermont. 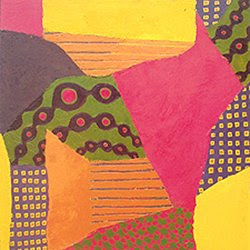 In recent years, her work has graduated from figure and landscape to color and pattern abstractions. On view at artSPACE@16 is her painting series entitled "INTERIORS". 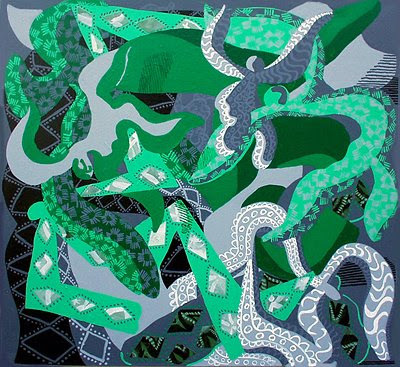 These works are inspired by the patterned fabrics of contemporary and ancient interior wall decorative art. 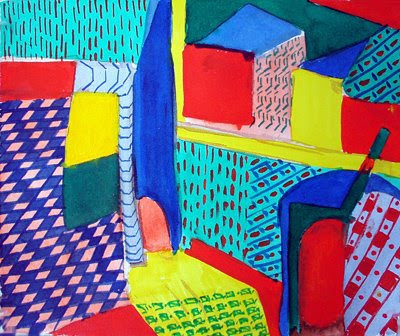 She is interested in how patterns alter the placement of planes within the painted space. Pachon, who has a painting studio in her Malden home states, "I begin by drawing the space and objects surrounding me in my studio. I then elaborate the drawings by adding color and pattern, no longer relating to their original source. I then make the paintings based on the finished drawings. As I develop and re-work the paintings, they become completely independent from the initial drawings yet still refer to interior space." The saturated, high contrast color Pachon uses brings light and activity into her work. They scream their celebratory sensation in the interior spaces she has created. Image: Painting by Carolina Pachon. Pachon's recent exhibitions include: the DeCordova Museum's Corporate Program; 12X12 HOLIDAY ART SHOW at Bromfield Art Gallery, Boston, and SENIOR SHOW at Massachusetts College of Art. 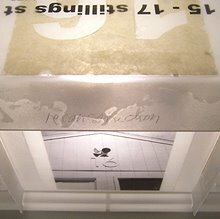 Pachon received a Departmental Award from the Massachusetts College of Art in 2004. She became a regular attendee of the Malden Sketch Group's Monday drawing sessions at the Oak Grove Community Building soon after she moved to Malden. In the LOCALS: III, John Rodzvilla presents two work series: mixed medium works on vinyl albums entitled the "GROWTH SERIES"; and a collage series based on roots and rhizomes. Rodzvilla is very much interested in the hidden world. Germs, microbes, cells, and diatoms present the subject matter for his work. His "ROOTS AND RHIZOMES" collage series uses pages from old pulp novels to create a system of roots and rhizomes. They are maps of the artist's unconscious. The sentences are the roots that connect ideas and the runners eventually bring them to the surface. "While winter is for hibernation," Rodzvilla states, "beneath the surface, winter's cold and blinding snow cannot reach and life goes on slowly, quietly; preparing for the show in spring. This underground world is the real world of the winter." 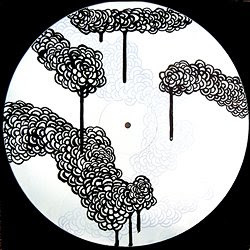 Rodzvilla's "GROWTH SERIES" are drawings with ink and spray paint on old vinyl albums referencing natural phenomena that are both familiar and mysterious. They seem like an out- of- control growth reminiscent of the metamorphosis of cell caused by a virus or disease. Besides working for a Cambridge publishing house, John Rodzvilla finds time to work in his home studio while maintaining a general interest website called guttertype.com. He is an active member of several online mail art communities. Rodzvilla has participated in several mail art shows around the country and other local group shows including: BAZAAR BIZARRE, at the Cyclorama, Boston; Harvard University Charity Art Auction, Cambridge; NUDES, at Atlantic Works Gallery, East Boston; VINYL KILLERS 3, at Zeitgeist Art Gallery, Portland, OR; LOVE SMALL juried by Adria Arch, at artSPACE@16, Malden, MA; COLLECTIONS, at Elise Mankes Studio Gallery, Marblehead, MA. 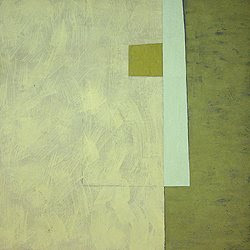 Bartek Walicki's recent paintings relate to large color-field and collage-derivative paintings. 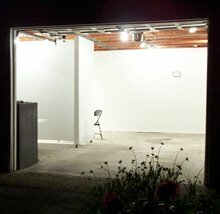 This body of work is offered as environments that investigate the relationships of people to their immediate surroundings. "Cinema, current world events, graphic imagery of popular culture and landscape of the urban strip and the deciduous forest have been guiding my investigations for the last several years." Bartek, who paints from his home studio in Malden stated, "My paintings are most successful when they have an impact capable of rivaling the more prevalent images of the media and entertainment industry." His attempt in making paintings is to celebrate the joy and complexity of life with all of the visual and audible information provided by the immediate surroundings. 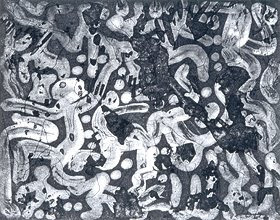 Walicki also shows his latest etchings in this group show. They are small, compared with his large paintings, "…because I wanted intimacy." The element of nightmares is prevalent in his etchings, where the invented characters interact. The prints are inspired by his interest in cinema, specifically films such as "Hotel Rwanda", "The Seventh Seal", "The City of God" and "The Black Orpheus", as well as by the macabre and current world events. "The recent genocides in Africa and Asia, the middle eastern situation and generally the increasing violence in the world are realities that I find particularly disturbing." Image: Prints:Etching by Bartek Walicki. Bartek Walicki was born in Warsaw, Poland in 1977. He received a Baccalaureate of Fine Arts from Massachusetts College of Art in 2002. In 2005 he graduated from Boston University's College of Fine Arts with a Master of Fine Arts degree. This exhibition is supported in part by the LEF Foundation’s Contemporary Work Fund. 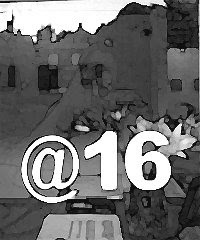 It also received in-kind support from the Artists Foundation and the artist-volunteers of artSPACE@16. 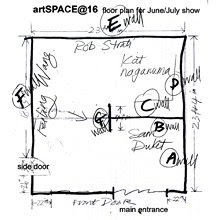 For more information please visit www.artSPACEat16.com.